At least in Milford on the Sea, Hampshire. And we've found a lovely bed and breakfast -- The Bay Trees. 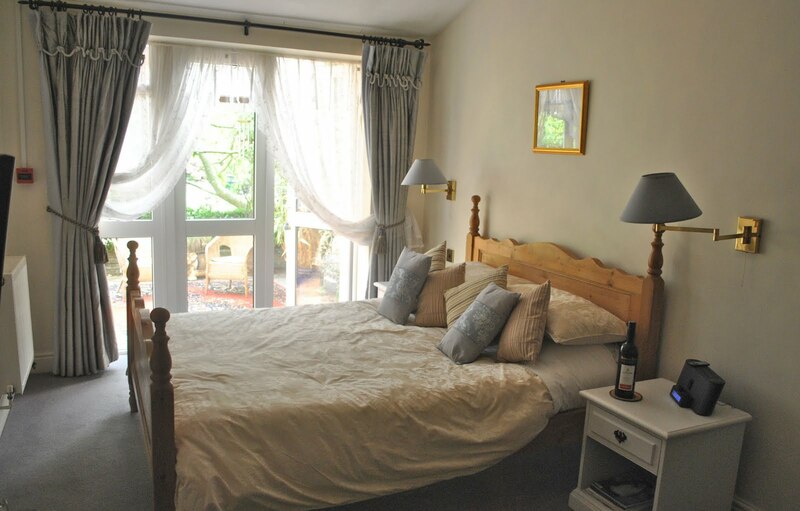 The bed in a lovely room overlooking the garden. 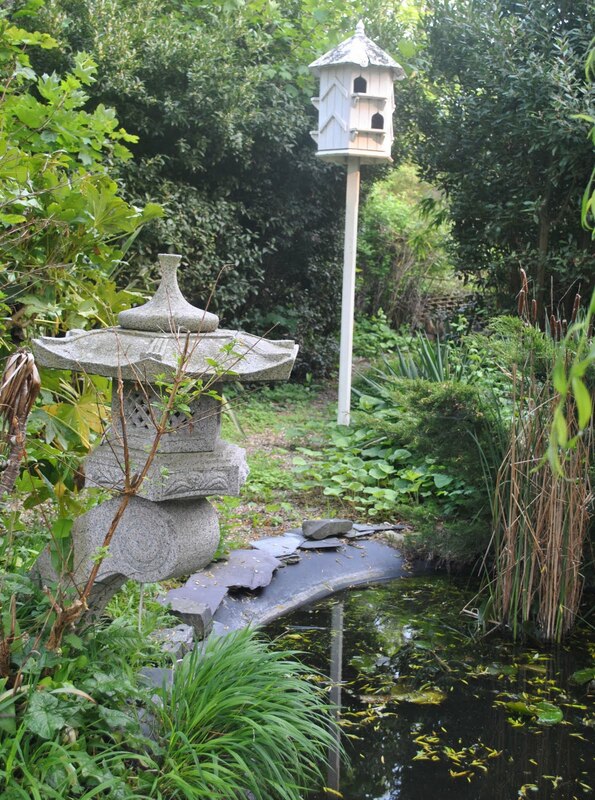 And the garden . . . complete with ducks -- is so beautiful and so British! A place for tea . . .
And the breakfast. 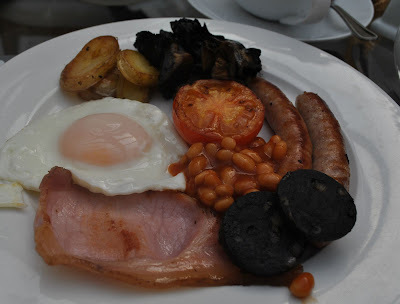 A traditional English breakfast with tomatoes, beans, mushrooms, sausages, bacon and a properly cooked egg. Served with toast, tea and orange marmalade! And the papers at breakfast this morning . . . Headlined as most papers across the world . . . with the Royal Wedding. A lovely picture of a wonderful couple. 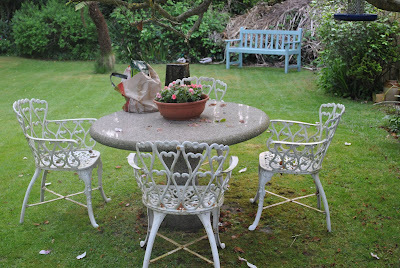 Bay Trees is a terrific bed and breakfast and such a special place to start our stay in England. We're leaving Milford on the Sea, Hampshire, today to head for our cottage in Chitterne, Warminster. I'm doing what everyone else not only in America but in the world is doing today - - - watching the Royal Wedding! But not just watching, it's also a great time . 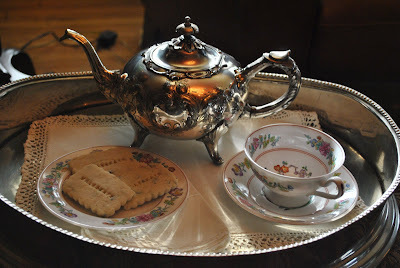 . .
For tea!!!! A silver tray (it is the Royal Wedding, after all), an English silver teapot, and a Spode cup and saucer and a plate of cookies. The tray on the end table in the living room so that I can put my feet up as I watch the festivities! While I sip tea and munch on lavender shortbread -- imprinted with "Wills & Kate"!!!! I do hope everyone had a grand time watching the wedding today. All of the pomp and circumstance that the British Royalty do so well. We, at Linderhof, wish the bride and groom the best. Every afternoon at half past three, we stop and have a cup of tea. 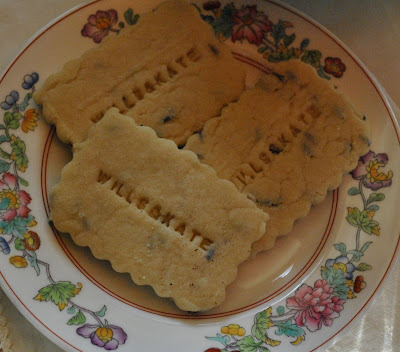 Sometimes are tea treats are Walker's Shortbread (if I haven't baked) or a cookie that I make for my afternoon tea . . . but every so often, I treat myself (for one reason or another) to a real dessert. My afternoon tea is always "blue and white" -- a teapot -- this one the Blue Willow which I brought home from a street market in England, a Asiatic Pheasant from Royal Stafford and a Blue Room teacup and saucer. 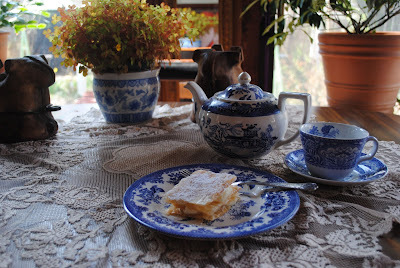 There's always music playing while I have tea -- usually Mozart or Bach but a special favorite is Tchaikovsky for Tea Time -- the perfect music for afternoon tea. And the treat . 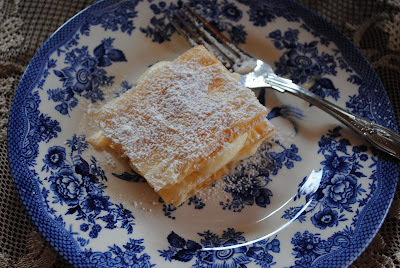 . .
A white chocolate napoleon. It was an extremely indulgent tea treat. It's simple to make with phyllo dough . . . and instant white chocolate pudding!!! A sprinkle of confectioner's sugar makes it look even more indulgent. Refreshed, I can go back to the garden -- weeds (and sunflower sprouts) are everywhere!!!! We love leg of lamb and it's great for Easter . 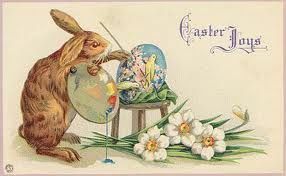 . . but, alas, there is never as many around the Easter dinner table as there is around the Thanksgiving or Christmas dinner table . . . which means that there is usually a lot of lamb left. But, actually, we don't mind for not only do we love leg of lamb but we also love . . .
lamb curry!!! We don't have a "real" recipe -- but it's full of onions and lamb and both sweet curry and hot curry. Served with rice and condiments -- raisins, yogurt, coconut, peanuts. Things we have in the pantry. We never buy condiments especially for curry! 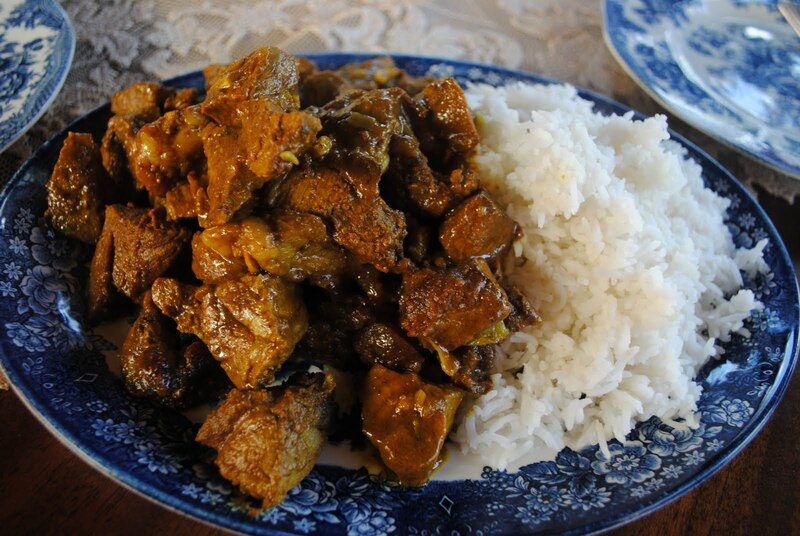 It's a rite of Spring -- the lamb curry that follows the leg of lamb Easter dinner! Bed linens are important at Linderhof. A well made bed, wether for ourselves or our guests is important. Because as much as we like to pamper our guests, we like to pamper ourselves as well. 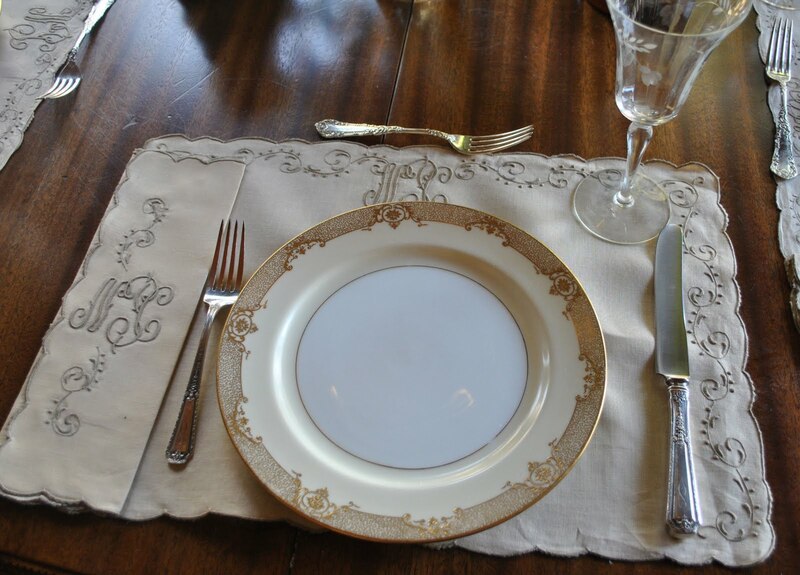 Linens are always white and if they're old, so much the better. At Estate Sales I'm always searching for vintage pillowcases and top sheets. 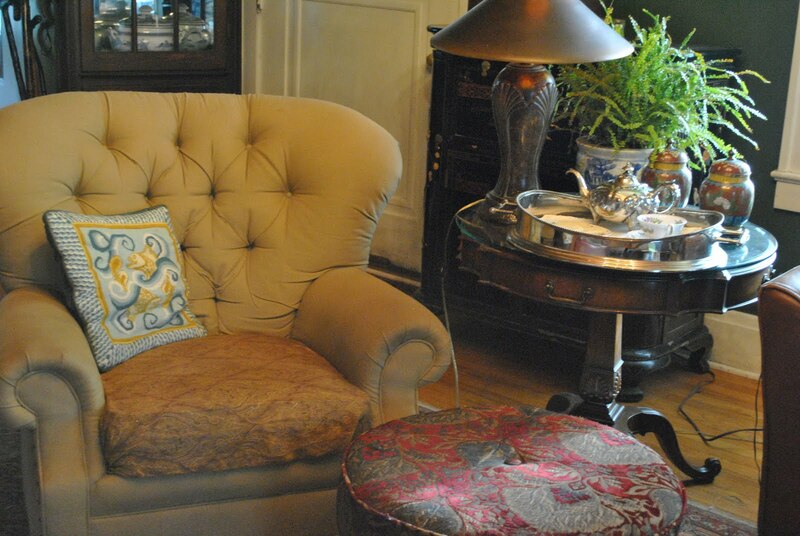 Old linens have a "patina" that make them soft and comfortable. It's important that our guests feel at home, therefore, there are four pillows on the guest room bed -- two foam and two feather. 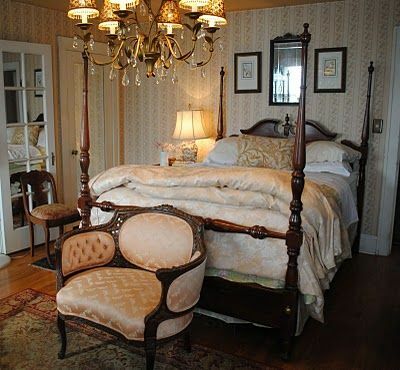 Two additional pillows are in the armoire in case they are needed. The bed linens are all white. There is nothing like crisp white bedding! The bedspread is a matelasse in an apricot color. For warmth at the foot of the bed is a feather duvet with a cover in shades of green. It's a bedroom that says welcome and a bed that says comfort! 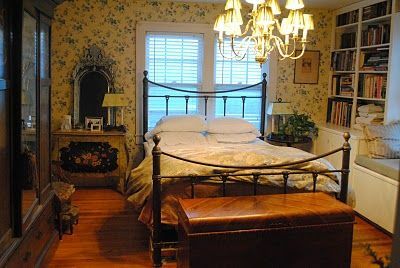 Husband Jim is a dear for he has spent more of his life in pink rose bedrooms. Our first apartment had pink rose paper in "our" bedroom and when we moved to Linderhof, the master bedroom was papered in pink roses as well. We love the paper, it was done by a dear friend who is no longer with us and I want to keep it as long as possible. We have four feather pillows on our bed for we love feather. I'm a one pillow person but husband Jim is a two so one spends the night on the chair by the bed. A soft green quilt with pink roses covers the bed and at the foot is a feather duvet clad in a beige duvet cover with white roses. It's a comfy bed we think and we like the tallness of it. It seems strange when we sleep elsewhere and the beds are so low -- it's almost like sleeping on the floor!!!!! We believe that a bed should be comfortable and welcoming . . . and we think the beds at Linderhof covered in vintage linens and piled high with pillows and duvets are! Do you believe in faeries? 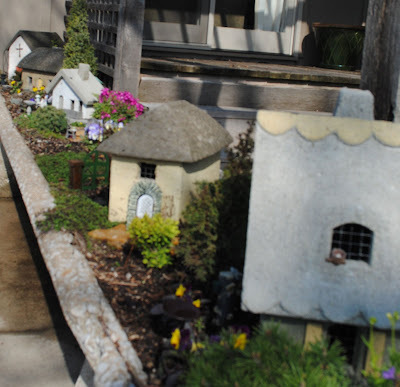 We certainly do at Linderhof and we have a faery garden at Linderhof and we admire faery gardens elsewhere. When I think of faery gardens I think of one cottage for a faery to live in . . .
but there are sometimes faery villages . 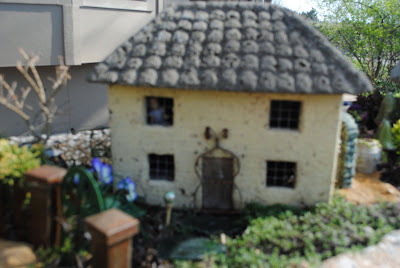 . .
Where faeries gather and like an English village, the houses are all different . . .
And a two story one . 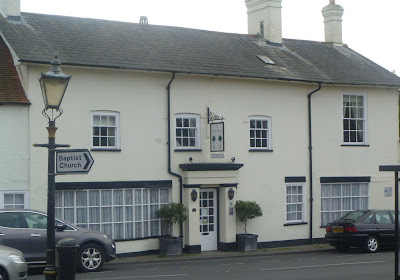 . . and do you see the bit of blue in the left sided upstairs window? It's a faery! 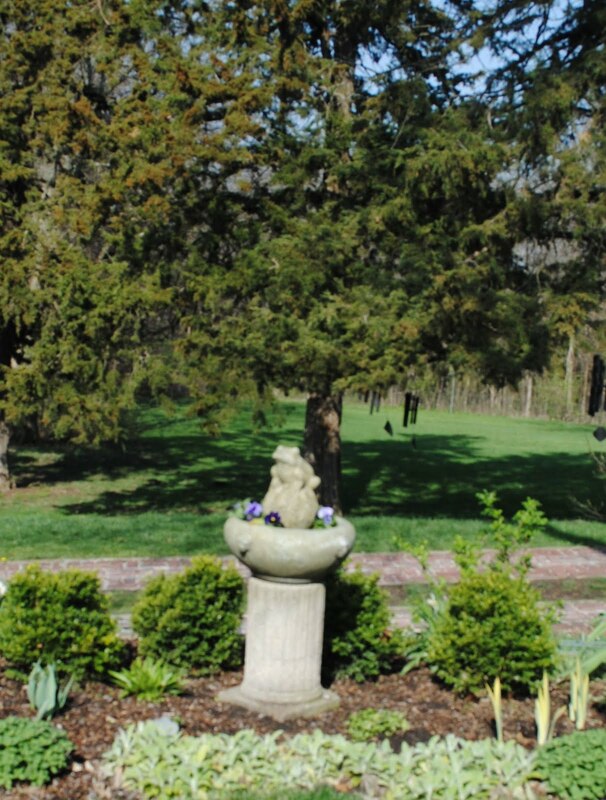 A grander house -- two story with great gardens! Faeries are out and about in this garden! A scene from the faery village . . . 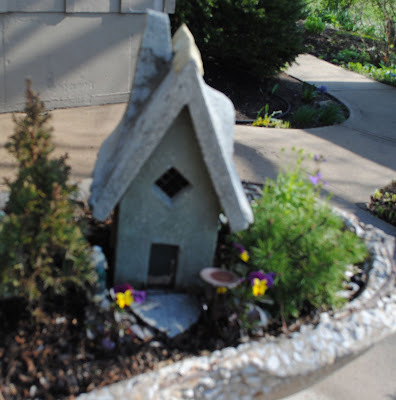 These lovely faery gardens are at Red Cedar. 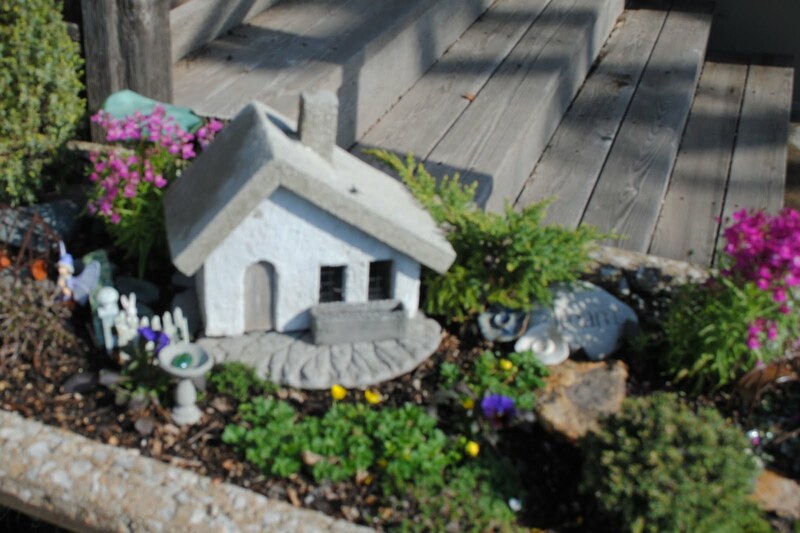 Lots of little lovelies to decorate faery gardens are in the shop. We've bought some and admire others every time we go. 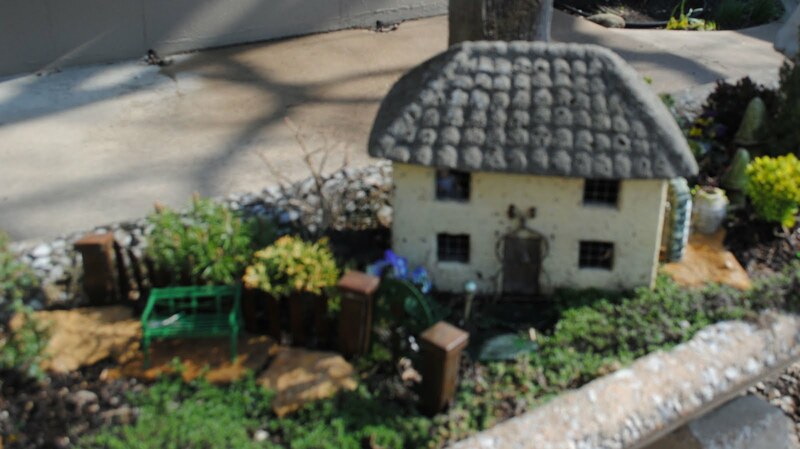 I do think, this year, that Linderhof's faery garden needs some additions! It's Wednesday and time for Outdoor Wednesday. So please join Susan at A Southern Daydreamer. Many years ago, a friend rehabbed the old railroad hotel, The Courtland, in our little town as a bed and breakfast. When it was up and running, she decided to turn the hotel dining room into a restaurant -- first serving lunch and then adding dinner. She had a signature dessert -- Buttermilk Pecan Pie. It was not her recipe, but rather one that she found in Midwest Living magazine. It was a good pie -- tart and sweet with the crunch of pecans. And although her food were very good, the pie was the reason to lunch there! And although it had appeared in the magazine, I couldn't find the recipe and I did beg for it but she would not part with it. It was their signature pie!!! Several years later, she was forced to close the restaurant as well as the bed and breakfast. The day after she closed, she called and gave me the recipe for the pie. 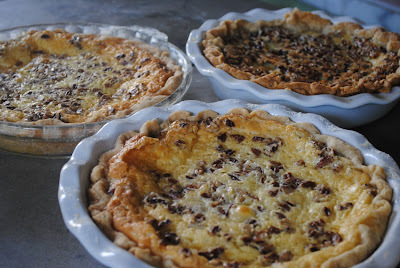 I renamed the pie The Courtland Buttermilk Pecan Pie in her honor. The pie was not a Midwest Living invention. Rather, as legend has it, the pie was originally created for President Harry S. Truman. President Truman was scheduled to come aboard the USS Missouri. The visit also included lunch. 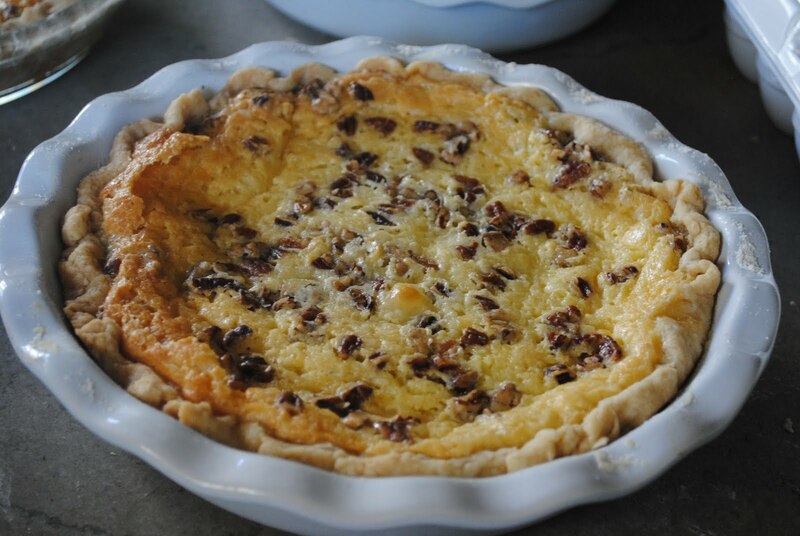 The cook on the Missouri knew that President Truman liked chess pie and so he took the familiar pie, changed the milk to buttermilk and added pecans. Rumor has it that Truman pronounced the pie "delicious"!!!! And it is!!! 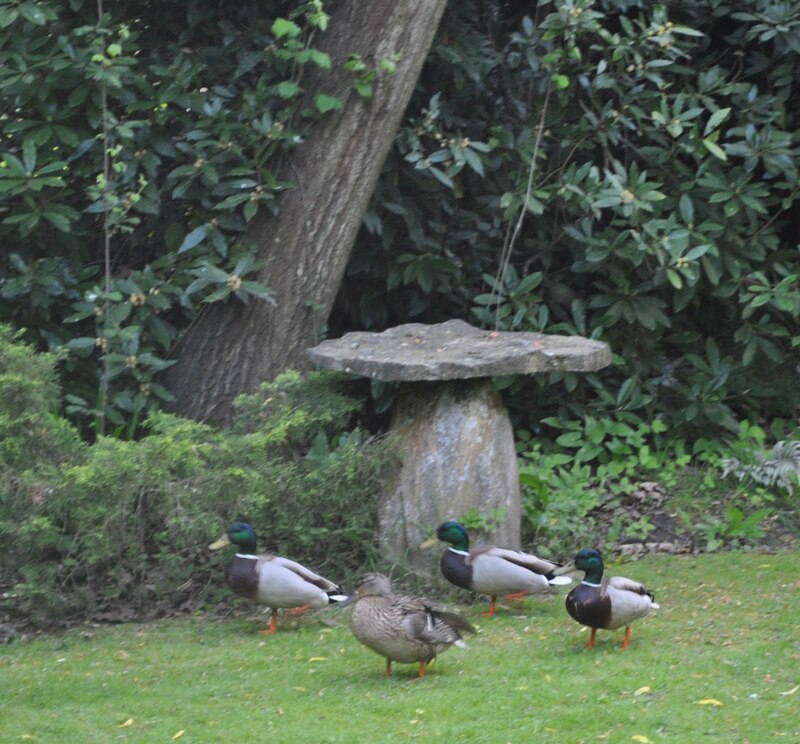 It is often served at Linderhof when we have guests for lunch. And in our little town on the prairie, oftentimes restaurants will have it on the menu. 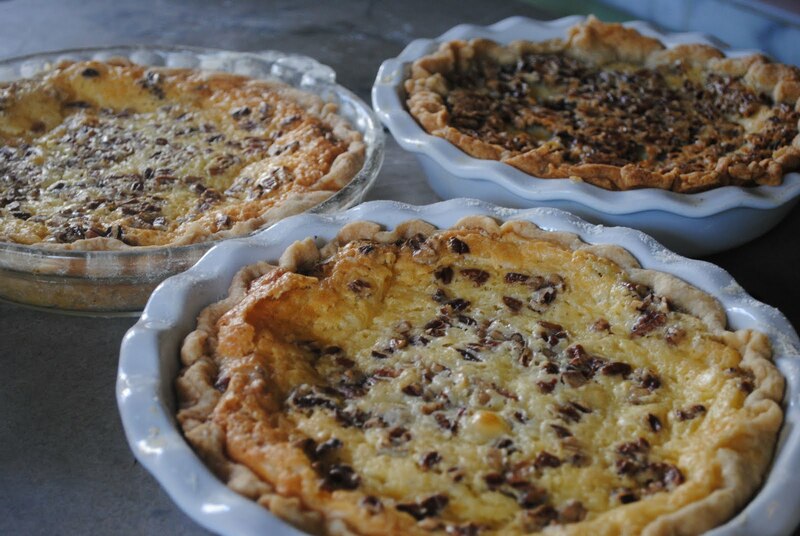 Always called The Courtland Buttermilk Pecan Pie. Paying homage to the woman who reopened The Courtland and made this pie the signature pie of her restaurant. 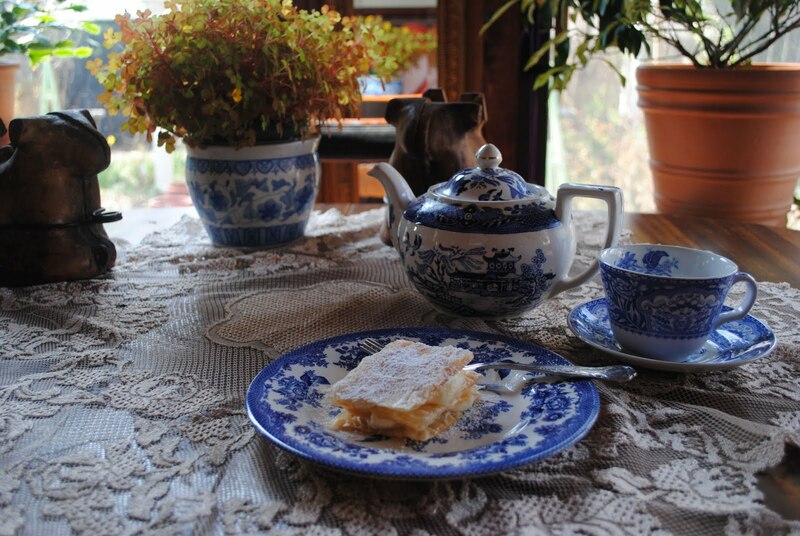 We make it so often at Linderhof, that often when asked to bring dessert for a crowd, it is our dessert of choice. Making three of them is as easy as making one!!!! Cream butter and sugar. Blend in vanilla. Stir in eggs one at a time. Combine flour and salt and add. Stir in buttermilk. Pour mixture into unbaked pie shell. Sprinkle pecans on top. Bake 1 hour and 30 minutes until pie is set. 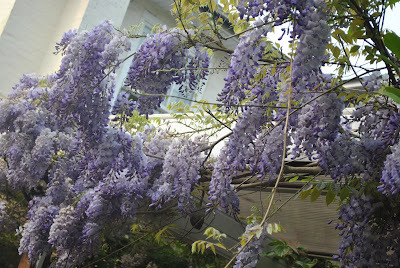 2010 was certainly a lilac year -- 2011 is not!!! The lilacs are blooming but they are not as prolific as they were last year. Bouquets, however, do grace tabletops at Linderhof as long as they bloom. This post was originally posted on April 20, 2010. The lilacs in 2011 are blooming at about the same time! It is definitely a lilac year. The bushes are filled -- absolutely filled -- with blooms and the fragrance as you enter or leave by the back door is heady! For there are 3 bushes that line the drive and they are a mass of lilac. They're the "children" of some forgotten bushes at an abandoned house in Nevada, Missouri, and after we moved to Linderhof, I would pick the blossoms off of the bushes and one day I got brave and dug up three starts. (Yes, I know I was trespassing -- but no one appreciated the bushes and I certainly did). Two of the bushes I planted between our driveways and the other by the back window of the dining room. They grew and flourished. And they bloomed -- but never as profusely as in 2010 -- A Lilac Year. The third bush that lines the drive is a descendant of the lilac bush that was under the bedroom window in the apartment that my parents lived in when I was born. A start was taken from that bush when my parents moved into a house across the street and when they moved to suburbia six years later, a start of that bush went with them. I got a start of the suburbia descendant the year my mother died. The following year, this wee bush bloomed -- one bloom. I think it was a message from my mother. For it didn't bloom again until it was of blooming size. It's a big bush now and this year, it's loaded with the old fashioned lilac lilacs! 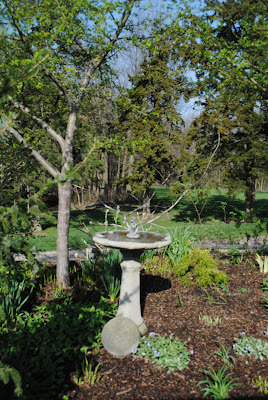 No fancy cultivars for me -- the old fashioned farm lilacs are perfect for Linderhof's old fashioned garden. 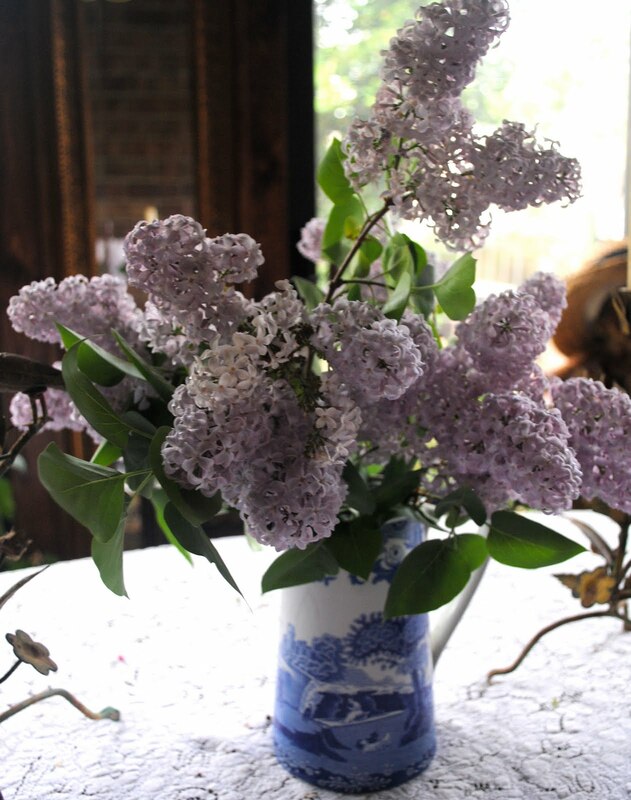 And what to do with an abundance of lilac blooms. 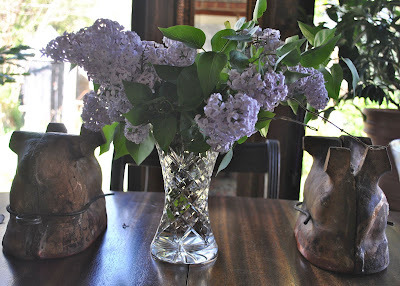 Cut them and bring them in . . . . so that the breakfast room and living room smell like lilacs as well as the outside! 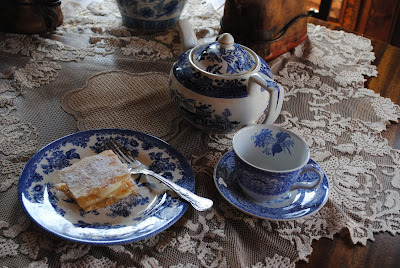 They make a spectacular bouquet in the blue and white Spode milk pitcher. And I think you can almost smell the lilacs . . . can't you? 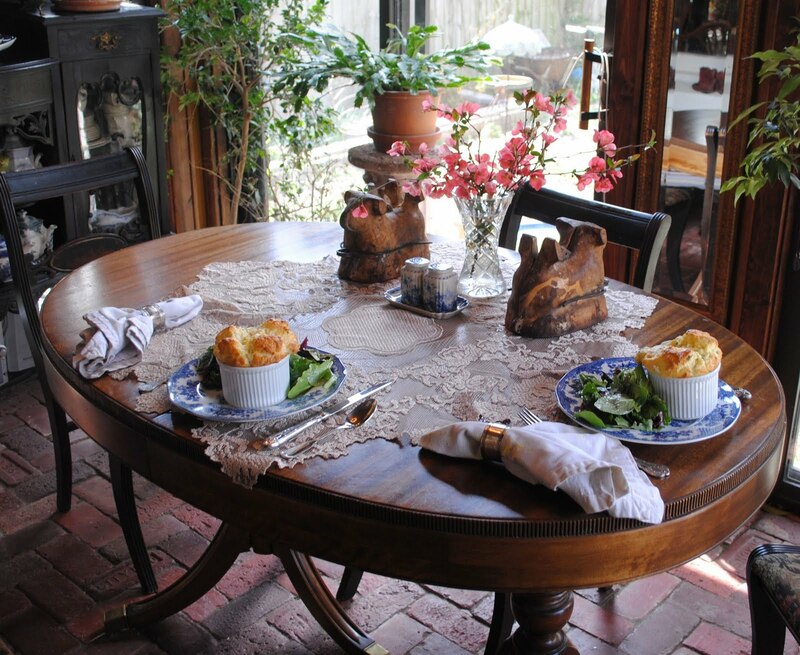 Most noontimes we have lunch at home -- in the breakfast room or in warm weather on the screened in front porch or even the back garden. A sitdown lunch -- not a hurry up and grab and go lunch. Sometimes it is just a sandwich or soup but oftentimes, it's something I've fixed especially for lunch. And we set the table with real dishes and cutlery. For it's a relaxed meal with music wafting gently from the stereo. While we catch up with the mornings doings and share our plans for the afternoon. I have been so hungry for a souffle. But, alas, a souffle is rather big and souffles do not make good leftovers (although Oliver thinks leftover souffles make good Oliver food!) so . . . I've been going "souffleless"! Until I bought a new cookbook, The Pleasures of Cooking for One, by Judith Jones. (She, who made Julia Child famous) I bought the book not because I only cook for one but because the recipes were really very very good but the quantity was small and for the two of us I could just double her one. And I bought the book because on the cover was a souffle!!!!! On the way home from the city, we stopped by William-Sonoma to buy two required size souffle dishes. And a couple of days later, for lunch we had . 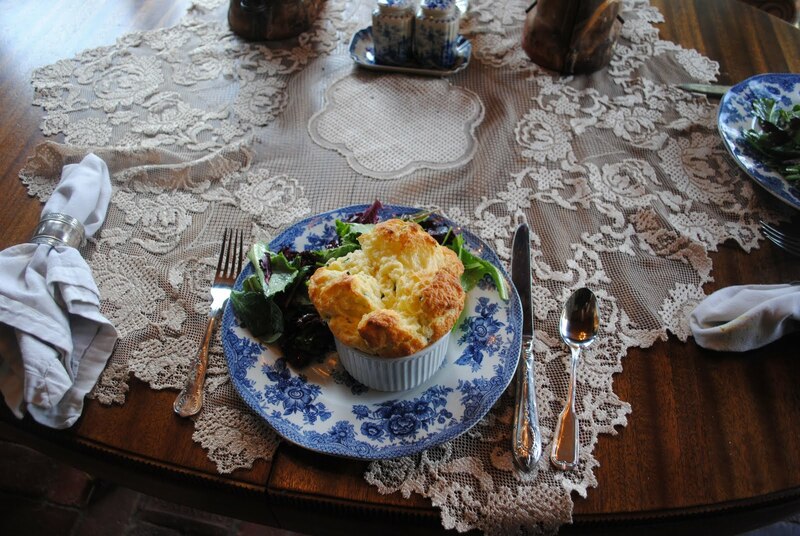 . .
A blue cheese and chive souffle -- which was divine!!!! Blue cheese because it was the only cheese I had in the fridge (other than Parmesan) and I didn't want to go to the store -- the chive because I had a bunch from the garden and thought that they would go well with the blue cheese. Husband Jim thought it fantastic and we lingered a bit over this lunch. 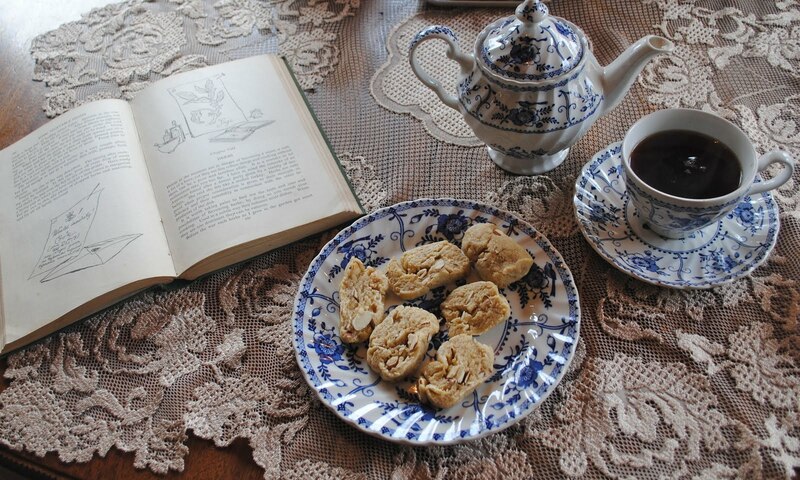 I've loaned the cookbook to friend Sally and don't have the recipe to add to this post. But I will post it when she returns it. It's Friday and so I'm visiting Michael at Designs by Gollum for Foodie Friday. If you like souffles and don't have a large number to feed, this is a winner of a recipe and the $35 I spent on souffle dishes is $35 well spent! 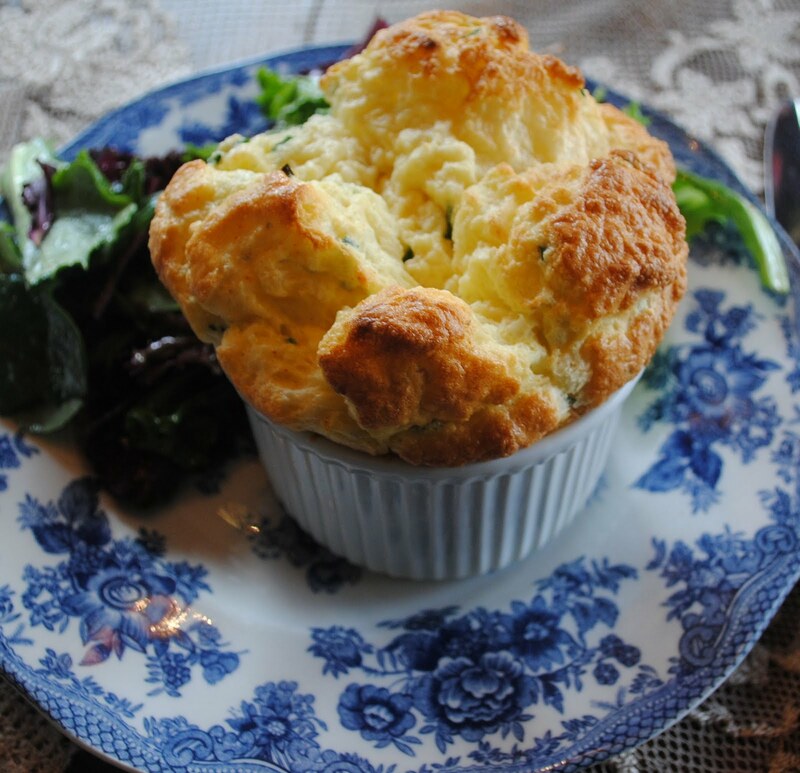 They make a great lunch (or a light supper) and it won't be the last time we'll have these souffles! 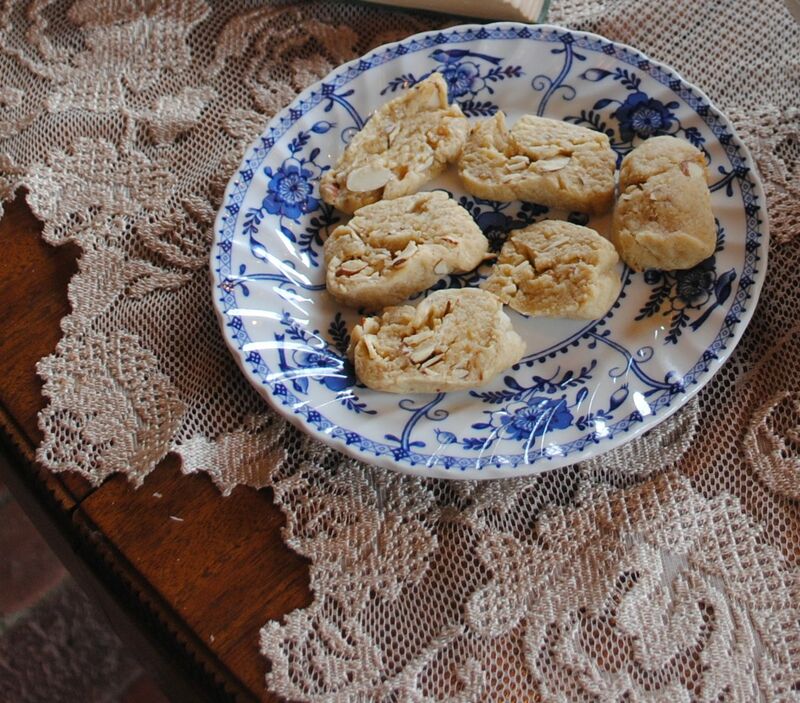 Thanks to Retabug for finding the recipe on-line!!! I've added it below! Smear 1/2 t. softened butter around the inside of a souffle dish and sprinkle Parmesan over it. Preheat the oven to 425. Melt 2 T. butter in a small pot and stir in flour. Let cook over low heat for a minute, then remove from heat. Pour in milk, whisking vigorously and return pot to medium-low heat to simmer for a minute, stirring constantly as the sauce thickens. Season with salt and paprika. Remove from heat and whisk in egg yolk. Put egg whites in a clean bowl and beat until they form soft peaks. Add a dollop of egg whites to pot and mix in along with about half of the grated cheese. Fold in remaining egg whites and cheese; transfer everything to the prepared souffle dish. Place dish on a baking sheet and set it in the middle of the oven. Turn heat down to 375 and bake 18 minutes until souffle has risen and top is lightly browned. NOTE: I also added a big tablespoon of chopped garden chives. 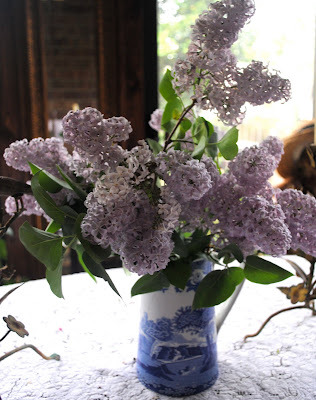 Adpated from The Pleasures of Cooking for One, by Judith Jones, copyright 2009.
love lilacs and lilac season and it's a good excuse to have company for lunch! We don't eat lilacs we just enjoy the heady fragrance while we enjoy a good lunch with Mozart or Bach playing softly in the background. Not the Lunch Bunch but two other friends joined me for lunch. 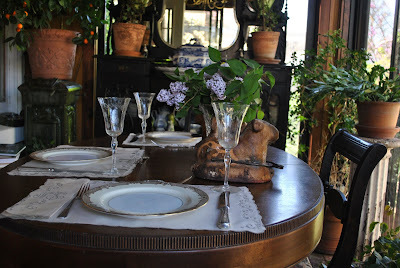 A simple table in quiet colors for the lilacs were the color on the table! 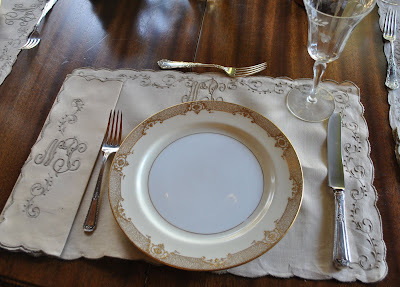 My grandmother's Noritake Marcasite plate, Jim's grandmother's cutlery, a goblet from the 20's, and great grandmother's placemats and napkins. (embroidered with her initials). I think they were her bridge linens for there are 12 and he always had 3 tables for bridge! A crystal vase full of freshly cut lilacs -- the two French lamb molds on either side -- because it is the Lenten season. I should remember to charge my camera a bit more often -- as I was taking pictures of the table -- it told me that I needed my battery recharged. It had been a busy week . . . . .hmmm!!!! But the food was heavenly and there were many "oohs" and "aahs"! 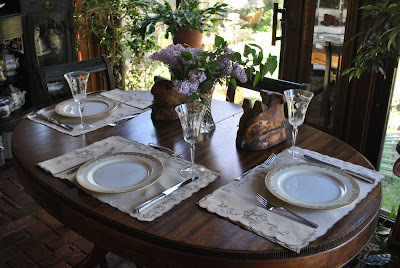 It's Thursday and I'm joining Susan at Between Naps on the Porch for Tablescape Thursday! 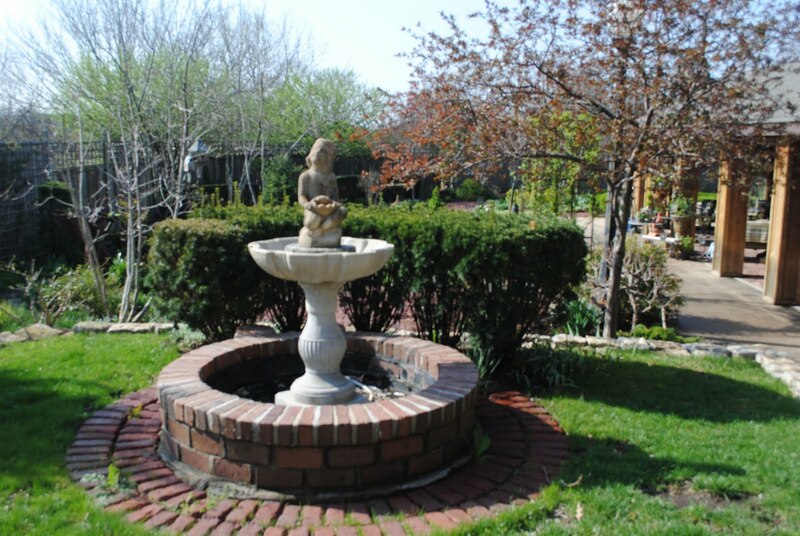 One of my favorite places is Red Cedar Gardens. 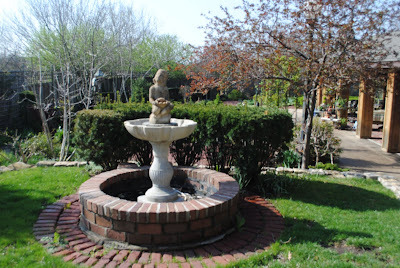 It's a great place to visit -- the gardens are amazing and an even better place to shop. 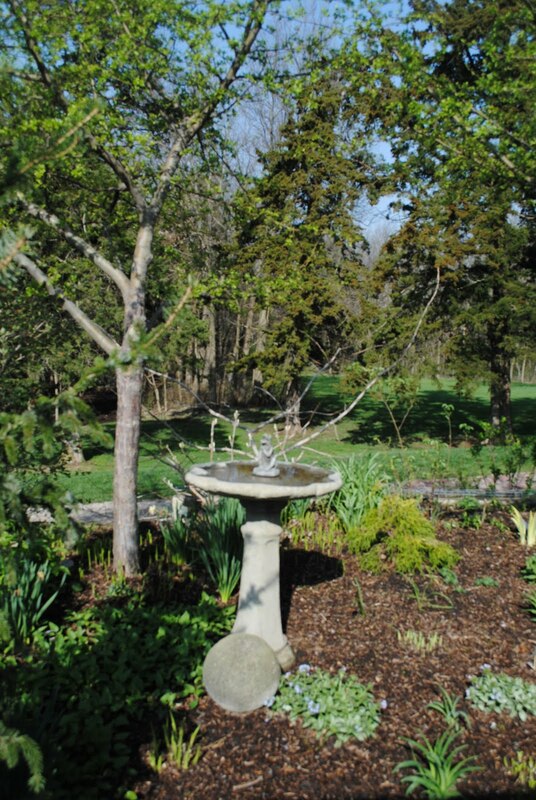 Ricky aways has the best plants and garden accoutrements many of which find their way to Linderhof's garden! It was a pleasure last week to teach two Cooking With Herbs Classes in this wonderful garden! 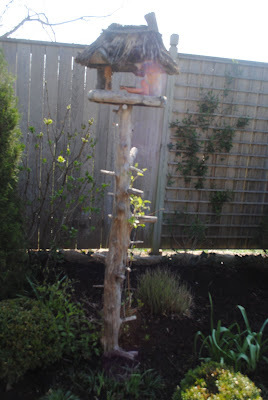 I shared the classes, now I'd like to share the garden!!! 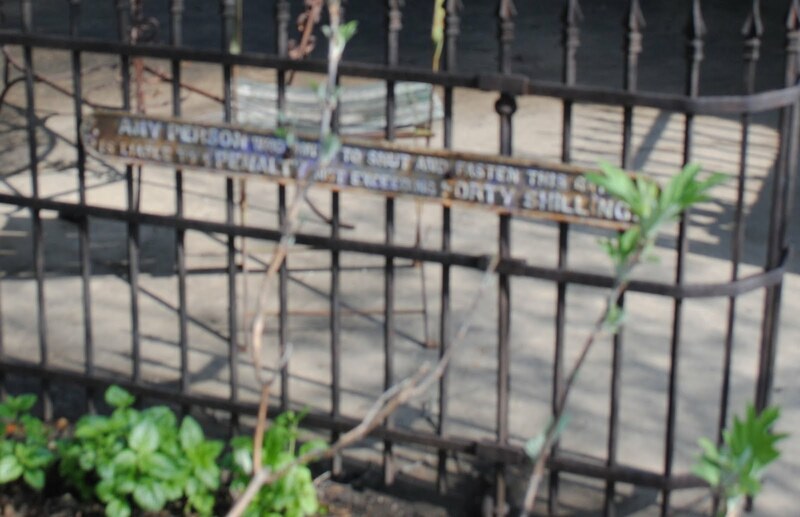 A great sign on the gate -- I'd love to have one just like it!!! 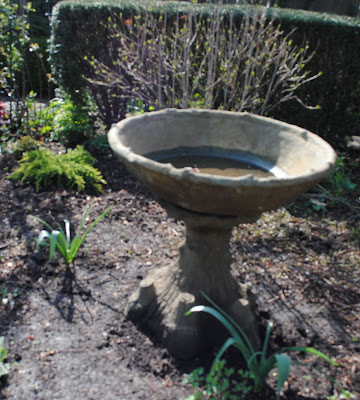 A new bird bath this year -- I've not priced it but I think it is stunning!!! However, there is no room at Linderhof for this wonderful piece! Another bird bath with a "creature" in the middle -- love how there is always something to look at which makes the garden pretty even at this time of the year when there isn't much blooming. 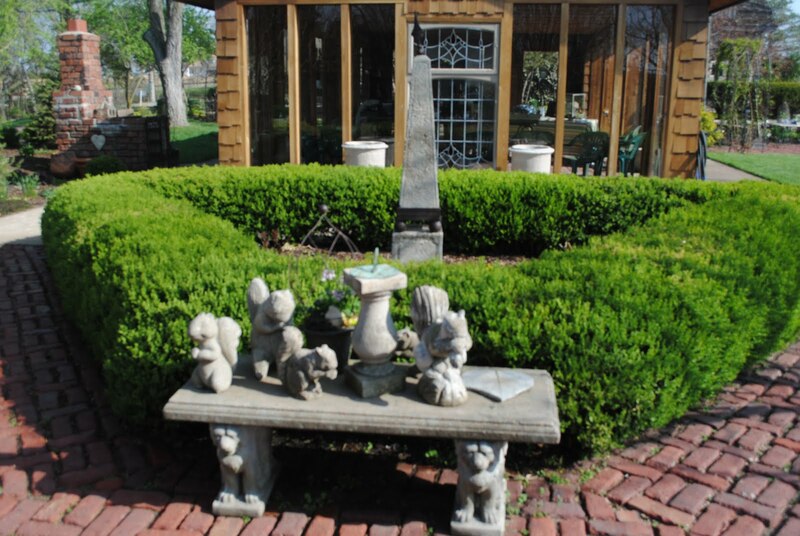 I have this same planter but mine's not on a pedestal nor does a frog live in the middle -- what a great idea! Don't saw down that old dead tree -- instead put a wonderful thatched roof bird feed on top! A wonderful fountain . 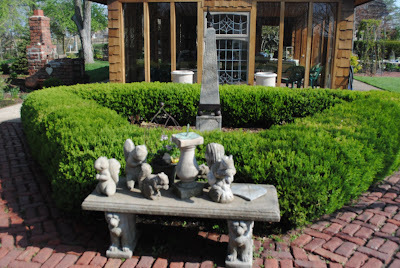 . .
A collection of statuary squirrels, a wee sundial and a pot of ferns on a wonderful concrete bench. If you live within driving distance of the Kansas City area, you need to visit Red Cedar. And, if you do, tell them Martha sent you!!! It's Wednesday and time for Outdoor Wednesday with Susan at A Southern Daydreamer. 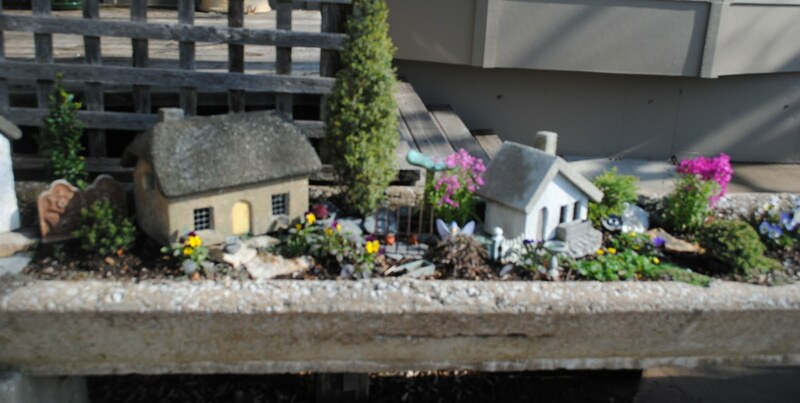 Now that spring has sprung, there is so much to do and see outside!!! I'm sure there will be some beautiful posts this Wednesday! Every afternoon at half past three, I stop and have a pot of tea. Mostly, at the breakfast room table. 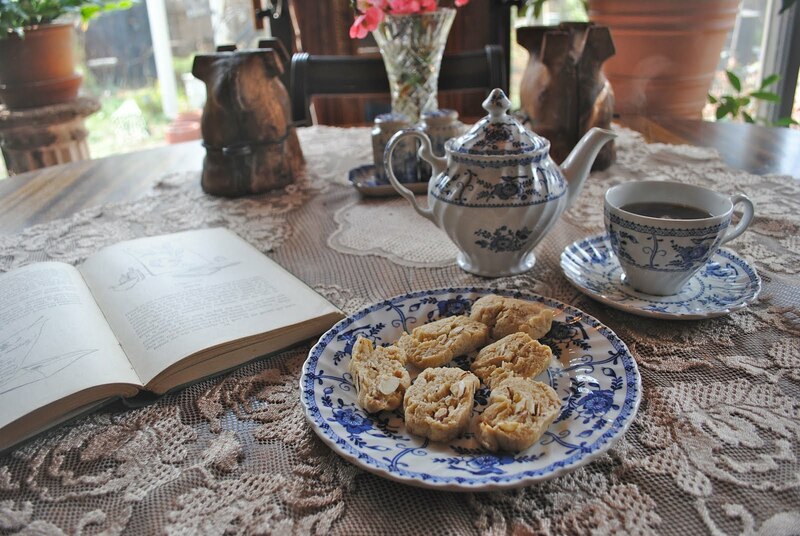 And you can't have tea without a sweet treat! And since it is just me, a book is always at hand as well. The book, Constance Spry's, Come Into the Garden, Cook. I was rereading the chapter on herbs in preparation for my cooking with herb classes last week. 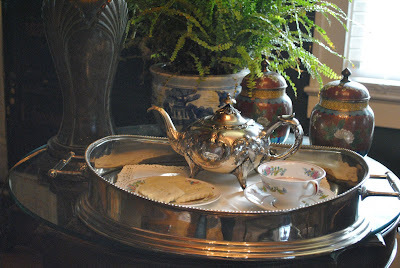 My Johnson Brothers, Indies tea ware. One of two wee pots that are perfect for tea for one -- the other is a blue and white one as well! The sweet -- almond icebox cookies from Judith Jones cookbook, The Pleasures of Cooking for One. I like sweets that I can bake off a few at a time -- because I really prefer fresh baked treats. These are handy to have in the fridge for tea time! Breakfast for One . . .